Cattier Organic Regenerating Body Lotion moisturises and regenerates the epidermis. Enriched with exfoliating papaya extract and antioxidant white tea, it optimises skin's natural regeneration process, softens and revitalises the skin as it leaves a pleasant fresh and tangy perfume. 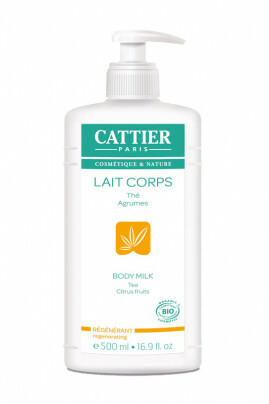 Moisturise your body with CATTIER Organic Tea Citrus Fruits Body Milk ! Ingredients of CATTIER Body Milk with Tea Citrus Fruits ! Aqua, Helianthus Annuus Hybrid Oil*, Glycerin, Caprylic/Capric Triglyceride, Sorbitan Stearate, Butyrospermum Parkii Butter*, Simmondsia Chinensis Seed Oil*, Camellia Sinensis Leaf Extract*, Methyl Glucose Sesquistearate, Papain, Maltodextrin, Benzyl Alcohol, Xanthan Gum, Sodium Benzoate, Potassium Sorbate, Parfum, Stearic Acid, Lactic Acid, Tocopherol, Citric Acid, Citral, Limonene, Geraniol, Linalool.